French historian; born at Lisieux in 1842. The first works that appeared from his pen were "Une Troupe des Comédiens" and "Essai sur la Restauration de nos Monuments Historiques Devant I'Art et Devant le Budget" (1866). 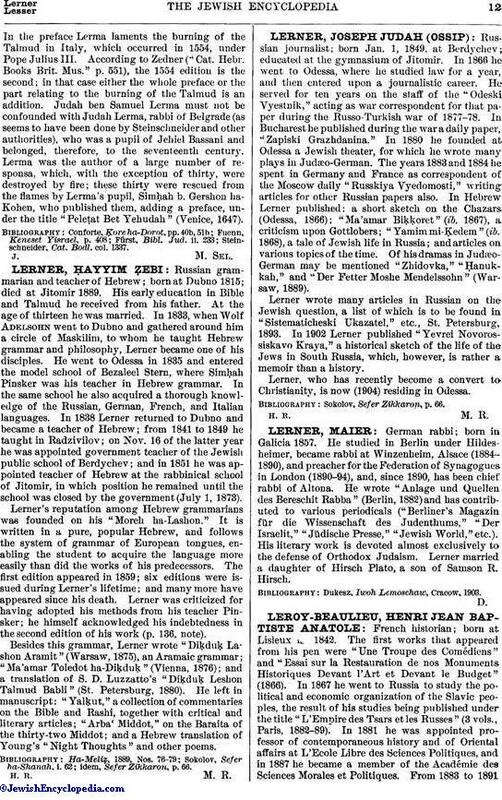 In 1867 he went to Russia to study the political and economic organization of the Slavic peoples, the result of his studies being published under the title "L'Empire des Tsars et les Russes" (3 vols., Paris, 1882-89). 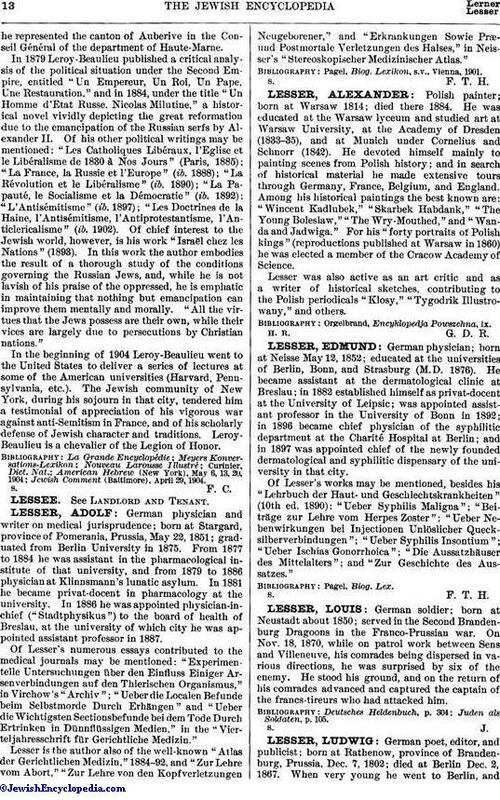 In 1881 he was appointed professor of contemporaneous history and of Oriental affairs at L'Ecole Libre des Sciences Politiques, and in 1887 he became a member of the Académie des Sciences Morales et Politiques. From 1883 to 1891he represented the canton of Auberive in the Conseil Général of the department of Haute-Marne. In 1879 Leroy-Beaulieu published a critical analysis of the political situation under the Second Empire, entitled "Un Empereur, Un Roi, Un Pape, Une Restauration," and in 1884, under the title "Un Homme d'Etat Russe. Nicolas Milutine," a historical novel vividly depicting the great reformation due to the emancipation of the Russian serfs by Alexander II. Of his other political writings may be mentioned: "Les Catholiques Libéraux, I'Eglise et le Libéralisme de 1830 à Nos Jours" (Paris, 1885); "La France, la Russie et I'Europe" (ib. 1888); "La Révolution et le Libéralisme" (ib. 1890); "La Papauté, le Socialisme et la Démocratie" (ib. 1892); "L'Antisémitisme" (ib. 1897); "Les Doctrines de la Haine, l'Antisémitisme, I'Antiprotestantisme, I'Anticlericalisme" (ib. 1902). Of chief interest to the Jewish world, however, is his work "Israël chez les Nations" (1893). In this work the author embodies the result of a thorough study of the conditions governing the Russian Jews, and, while he is not lavish of his praise of the oppressed, he is emphatic in maintaining that nothing but emancipation can improve them mentally and morally. "All the virtues that the Jews possess are their own, while their vices are largely due to persecutions by Christian nations." In the beginning of 1904 Leroy-Beaulieu went to the United States to deliver a series of lectures at some of the American universities (Harvard, Pennsylvania, etc.). The Jewish community of New York, during his sojourn in that city, tendered him a testimonial of appreciation of his vigorous war against anti-Semitism in France, and of his scholarly defense of Jewish character and traditions. Leroy-Beaulieu is a chevalier of the Legion of Honor. Jewish Comment (Baltimore), April 29, 1904.